Not all car accidents are caused by negligent driving.Talk to a Lawyer for Free 24/7 at (314) 361-4242! Bad weather conditions or poor road conditions are the cause of many car accidents. In the state of Missouri, many accidents occur due to the following defects in the roads. Deep, small holes in the middle of the road may cause serious accidents, especially on the highways. 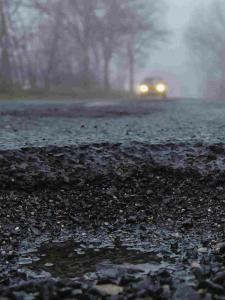 A small pothole on the road can cause a vehicle to skid or spin out, resulting in a serious road accident. Motorcycles and bicycles are more likely than cars to lose control after hitting a pothole. Expansion joints are used to connect a highway to a bridge or parts of a street. When the two parts are joined together, a rough surface is exposed in the expansion joint. This unevenness on the road can be dangerous, leading to a serious accident. Without regular maintenance, gravel or dirt roads can be dangerous for driving. In the rainy season, the road could be muddy and full of danger spots. It is advisable to avoid driving on such roads as much as possible. If you have no other option, drive carefully and slow down. There could be debris on a road, making it difficult for drivers to drive safely. Debris from a blowout tire, from collisions between two or more vehicles, or from falling tree branches create hazardous road conditions. State and local governments are responsible for keeping the roads clean and obstacle free. Failure to do so may result in fatal road accidents. (Click here to report a road concern). Weather-related car accidents increase considerably on slippery roads. If the surface of the road is slippery, a speeding car can skid or spin out of control when the brakes are applied. There are many reasons why roads could be slippery. For example, heavy rainfall or spilled oil can make a road slippery. A road may have lanes of different heights. This becomes dangerous when changing lanes. If an animal crosses the road suddenly, you may not have enough time to react to the situation. If you suffer an injury from a car accident due to poor road conditions, you may be entitled to file a claim for compensation. Contact a St. Louis auto accident lawyer to know your legal rights. Call The Hoffmann Law Firm, L.L.C. at (314) 361-4242 for a free consultation.